Well, had sufficient time on my hands so I threw together a rushed Digger since I wanted to see how one would look with new props and stuff. None of it is 100% accurate although I wasn't going for accuracy anyways. Hope that it's fun to drive around in though and enjoy! Me: Cloning and painting rims, adding Krysten's name on the door instead of Adam's for the updated paint for the normal season (Instead of the 35th Ann. Paint), Making the 3rd Gen BKTs more fps friendly for people with potato computers like me. Putting props on the (pre-modeled) chassis. 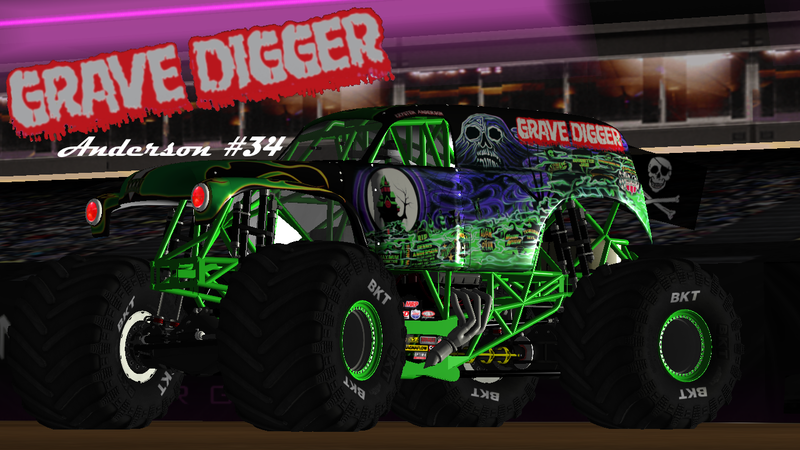 RORSeries/Frank: I believe he is the one that did the Grave Digger 35 paint and I just added Krysten's name instead of Adam's on the door. Rockgod: Original parts from his Grave Digger 34 and most of the node beam I think. Sim Monsters Community: Anything else. One last credit goes to @ItsLyfe for helping me by testing minor node beam edits and suspension setup related changes. Hello everyone! Today I am sharing with you my latest piece of content. It's no where near perfect but I need it to be on SM so I can use it for a league so... Here is my decently made Brutus that was run last year by Brad Allen. Credits go to Blaise for making the original truck. All I did was update rims and paint. Enjoy! Notice: This is cloned and working for all versions that I know of. PM me if it doesn't work and I'll try to help. This should be a standalone pack. Constructive criticism is appreciated! Swegliner849: Helping me figure out how to make flexbodies and texture them correctly. 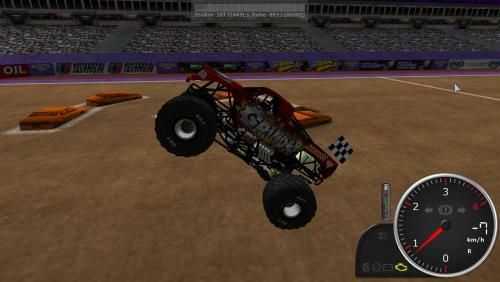 Garrett Hanson: Helping me figure out how to make ride height higher on Mutant Breakable. Rockgod88: Metal Mulisha breakable and regular. This pack is based off of the 2017 Metal Mulisha pack. Me: cloning stuff and making Mutant, and Blue Thunder flexbodies. Might also include a beta version of Bigfoot 14 Chromalusion breakable. Props aren't lined up and it's still a WIP. Overall, hope you guys Enjoy! Keep an eye out for an update or an additional part 2. This is my first replica truck. This truck is the 2017 (Revamped) edition that I heavily updated from the smv4 pack. A huge shoutout goes to @Garrett Hanson for helping me clone the body and relocating props. Thanks Garrett! Me: Cloning parts, painting some parts, editing the .truck files, creating breakable trucks. Garrett Hanson: Cloning tires and body and replacing old body with an updated body. Everything else goes to the v4 pack makers. Make sure to pm me if I forgot to include you. LETS CELEBRATE ALL THE CLICKBAIT LOL!!!! This is not the white edition but it is an updated v4 version. Sorry for all the clickbait. If enough people still want it fixed I can do it right this time. Huge shoutout to @Skyliner849 for helping me learn how to do some of this stuff. This is a custom truck on the chassis of Get Jolly. Thanks to mjfan16 as well. I painted and cloned the parts. Welcome to the stadium, Torchlight! Other Parts and Stuff: smv4 pack makers. If I didn't mention you please tell me. Thanks and Enjoy! Here it is! My first repli-custom. The truck is made out of most to all parts used from Lucas Oil Crusader 2015. A lot of the files in the pack are actually still named from the LOC pack because after trying my first attempt I wasn't able to rename without the truck not loading so it still has many LOC files in the pack. I painted the truck again and modfied a few props. I am hoping that the logos are aligned okay as I tried so many times to line them up. For all who were requesting there be clouds and Zeus on the truck I am sorry because I couldn't find a good pic of either. Other than that, I hope you enjoy my first actual truck! Any constructive criticism would be appreciated! $m@$#3r2016: Painting, Prop Modifying, Testing. Double.D: The original pack and .truck file creator. Thank you Double.D for making the original truck and pack. If you are in any way annoyed by me repainting and posting this, PM me and I will remove it permanently. This is the blue version of Greg Winchenbach's Crushstation. I figured since it has not been added to Sim-Monsters (I think), that it would make a good addition to all the awesome trucks in this community. Hope you enjoy! Me: Painting and adding Goodyear Tires. John? the file for the Goodyear Tires says GYJohn. The Rest: smv4 pack makers. Try to spawn the smv4 Crushstation into the game before spawning this one. This will ensure all the textures for the truck load correctly. Griivedigger101 requested this be made so I made it for all! Just a Grinder truck with BKT tires on it. Hope you guys enjoy and remember to like and review. (Reputation would help) Thanks and enjoy! This is the WF version Bounty Hunter fromt he smV4 pack. I added John Dough's BKT Tires which gave it a good look. Hope you guys enjoy and make sure to check it out! 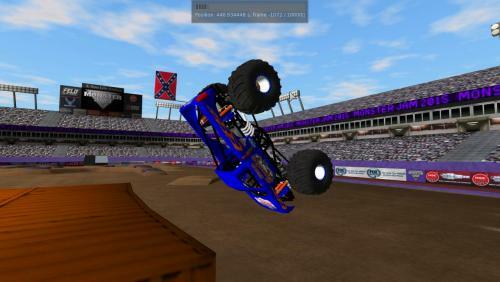 This is the Metal mulisha truck from smV4. I switched the original tires with some Goodyears. They look pretty nice on the truck and give the truck a gripping but not to much gripping feel while turning with the rear steer. Hope you like it! Tires: RockCrwlr's V4.5 Tire pack. 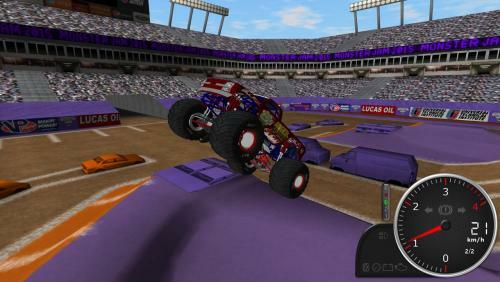 The MROR Iron Man blue truck from the smV4 pack. The only modification I added was BKT's. Hope you guys enjoy and please rate and comment. 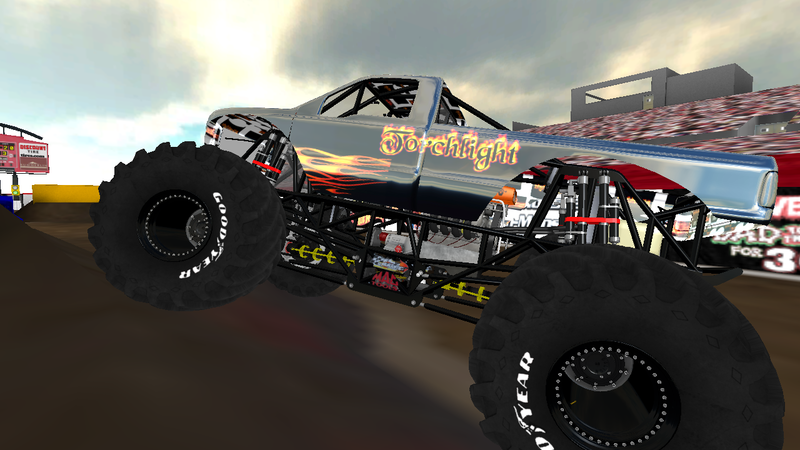 This is the smV4 pack's Black Stallion truck with John Dough's awesome BKT's slapped onto it. Hope you guys enjoy and please leave a like and a good comment. Another truck for lazy people. This is the smV4 pack LO Equalizer with Firestone Rcut tires from the V4.5 tire pack and I also added sounds from the v1.2 sound pack. Hope you guys enjoy and make sure to leave a like and a comment on how to improve or if it's good. 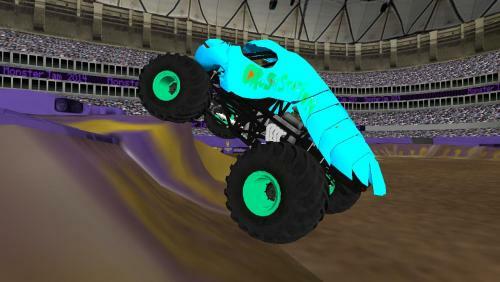 Tires: RockCrwlr's V4.5 Tires pack. Shout out: Thanks to all the creators who made the trucks possible. I'm very sorry I don't have any scratch projects. I'm in middle school and haven'st figured most of the truck making stuff out yet. Thanks everyone! Hello! This is my very first file so I hope you guys like it! This truck is the Anger Management from the smv4 pack. Before you decide I just copied it as my own, there are actually some changes but they're slight. The two modifications are the BKT Tires and the sounds. Hope you guys enjoy and if you'd like to see another truck or multiple trucks with BKT Tires, just ask me and I'll try to make it as soon as possible! P.S. Please message or comment me on how I did. Most of the truck: smV4 makers. Sounds: I believe Beau did the sounds. I modified the truck with the soundsv1.2 pack. Please message me on Sim monsters if Beau is not the original maker.